Alfred George Baggott - Butcher (PPP1924). 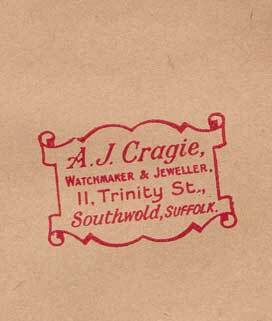 Arthur J Cragie - Watchmaker and Jeweller. Arthur has moved his business here from No 24 Victoria Street, renting No 11 from the Baggotts next door. His previous workshop sustained serious bomb damage during the war. 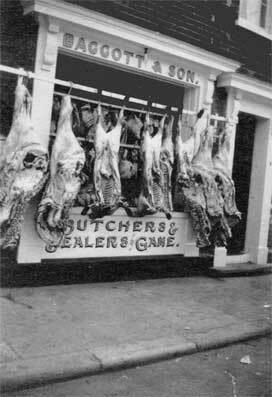 Alfred George Baggott's shop some time between 1916 and 1924 . 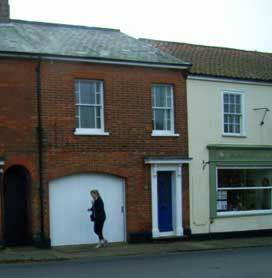 If you look above the white painted garage door in the modern photo (top) you can just discern the outline of the original shop window. Alfred George was the maternal great-grandfather of Peter G Parke who kindly supplied this photo (©GP G Parke). 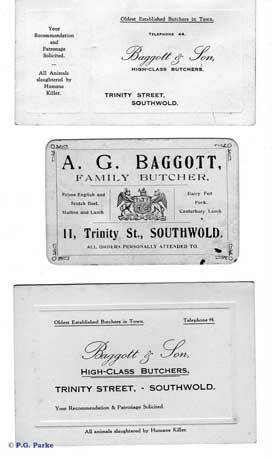 Three business cards of the early 1910s - from the collection of P G Parke, great grandson of A G Baggott. (©GP G Parke). 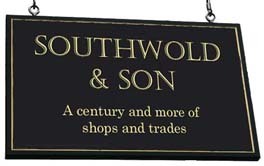 Adverisement in the 1936 edition of the Southwold Visitors Lisr.